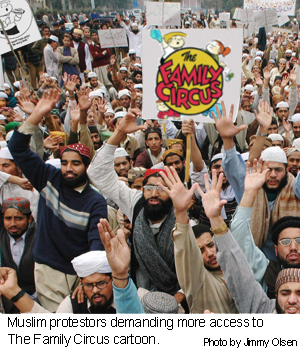 ISLAMABAD, Pakistan (MUN) – The Family Circus cartoon strip has joined the now-infamous Danish cartoons of prophet Mohammed in causing violent riots throughout the Muslim world. But this time, the point of the riots are to see more of the cartoon, not less. "We demand more access to Jeffy, Dolly, Billy and the whole gang!" screamed Pakistani cleric Abu al-Shaheen at a rally of some 35,000 people in the main square of Pakistan's capital city. As a show of solidarity with the puckish creations of illustrator Bil Keane, the crowd burned copies of Peanuts strips, along with those of Hagar the Horrible and Calvin and Hobbes. "Down! Down Peanuts!" chanted the crowd as the strips were set ablaze. "Peanuts’ Lucy is a filthy whore compared to the delightfully plump and virtuous Dolly!" said laborer Ali Hassan, 24. "We want to see more of Dolly and her dealings! Not some dirty Snoopy dog who eats the bones of the dead!" Rioters overturned cars, court rulings (some of the rioters were judges) and smashed the newly-replaced windows of the Danish embassy. “We probably should have waited to replace the ones they broke during the first Mohammed riots, that’s my b,” said Danish Ambassador Anders Flakkerssson. The main newspaper in Pakistan, The Daily Pakistanian, carries a small comics section featuring strips like Mustaffa Moose, the wildly-popular Yemeni Yassir: Freedom Fighter, and one simply called Couscous. The American contributions to the pages are Peanuts and Calvin and Hobbes, both of whose welcomes appear to be at an end. "When America leaves our region, we demand you take Peanuts and Calvin with you! Leave us our oil and Family Circus!" said al-Shaheen.